Building Lots! Which One is Right For You? Building lots or the house plan...which one comes first? This is where we try to answer that question...”what comes first the chicken or the egg”......To me it's the lot that comes first... I think it is easier to find a plan to suit the landscape...rather than the other way around. If you have a lot that has a beautiful sun set view in the back it would be a shame to have your main living area in the front where you can't enjoy that view... or if the view was in the front,.. then your main living area should be in the front...just some food for thought. Building lots will be as different for people as cars are. Some may like the subdivision atmosphere while others may like the county setting...to each his or her own..
Country or rural lots,.. on the other hand will give you a larger lot...more room for the kids and Rover to roam...Yes...more lawn to rake and mow...but this is were that lawn tractor comes in...that's good too... 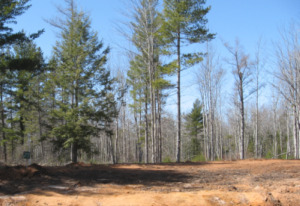 The country lot will normally require a septic system and a drilled well. So you have to weigh the pros and cons to see what is best for you. What seems like the more expensive lot may not be so in the long run. I bought my building site two years before I started my house. The value of the lot has almost tripled in two years..mainly because of a new subdivision being developed within a short distance from my lot. It's not that I am that smart... but I felt land value would go up... and that is why I bought the lot when I did. There has been six new homes go up in the last year. Some times ...if you look around...you may just find that bargain lot. A building lot can be a substantial part of your building budget. If you over spend on your lot then you may find yourself in a situation where you can't afford the house for the lot...I have heard of this happening. It has been stated that your building lot should not exceed 25% the the cost to build your home. If your home costs 200.000...then your lot should not cost over 50.000. A good place to start checking out building lots...is with a local realtor. They will have a good handle on what is happening in the area...and they will be able to fill you in on code requirements etc.